Tower was built by the Vikings of Scandinavia around 950 AD. Portuguese navigator Miguel Corte-Real, around 1500.
was built by the Chinese navigator Zheng He in1421. Henry Sinclair during an expedition led by Antonio Zeno in1398. 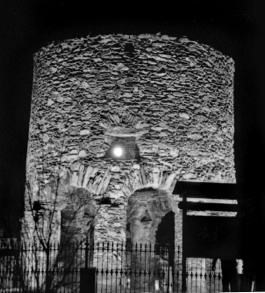 In 1995, Professor of Astronomy at the University of Rhode Island, William Penhallow, discovered several astronomical alignments in the Tower. The first-floor room of the Tower has three windows: the Northeast window, the South window, and the West window. Based on these clues (and more) Penhallow suggested that the Tower acted like a grand time-keeping device (a horologium). The movement of the solar disc (the image of the sun) inside a camera obscura is just like the movement of the tip of a gnomon’s shadow on a sundial. This kind of calendar room was used by astronomers of the Renaissance, especially in Italy and in Northern Europe. Penhallow predicted that on December 25, 1996, the full moon would be visible if you look through the West window, through the first floor room, and out the Northeast window. He was right! The interesting thing about this alignment is that, because of the moon's Lunar Major/Lunar Minor cycle, it will not happen again for another 18.6 years. 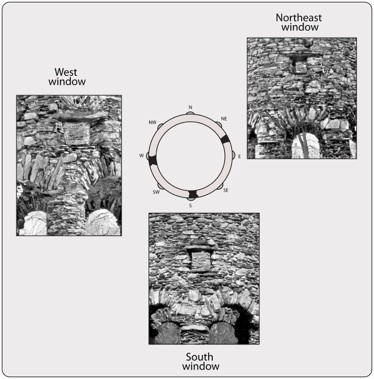 Penhallow also predicted that on the Winter Solstice, the sun would be visible if you looked through the West window, through the first floor room, and out the South window. He was right again! In 1583, John Dee used the camera obscura to show the Polish ambassador an eclipse of the sun. And what happened in 1583? In 1578, the adventurous courtier Sir Humphrey Gilbert was awarded letters patent for the exclusive right to discover and settle all of North America. All he had to do was to build a fort and occupy it for a year. For his vital assistance, Gilbert granted John Dee all the lands north of the 50° parallel. That’s all Alaska and most of Canada! Later in 1578, Gilbert set out with four ships. But due to bad weather they only made it to the middle of the Atlantic before they ran out of supplies and were forced to return to England. Over the next few years, Gilbert had a hard time raising more capital for another mission. In 1581, Queen Elizabeth I signed the “Recusancy Act.” A “recusant” was one who refused to attend services of the Protestant Church of England. Many English Catholics were being fined heavily and thrown into prison. Some Catholic families were sailing off to Europe, taking their wealth with them. Not only was this draining the economy, but these refugees were aiding the Catholic cause in Europe. If Peckham would fund Gilbert’s expedition to start the first English colony in the New World, the Catholics who settled there would be given complete freedom of religion. It was a win-win-win situation. Gilbert and Dee would get all of North America, the Catholics would be free from discrimination, and Walsingham would have quelled the discontent in England. John Dee (1527–1608) was perhaps the most skilled mathematician, cartographer, navigator, and astronomer in all of Elizabethan England. In his youth, he studied and traveled across Europe, learning from the wisest scholars of the Renaissance. He was fluent in Latin and Greek and had a library of over 4000 of the greatest books, dating from his era all the way back to antiquity. In 1577, Dee wrote 8 books convincing Queen Elizabeth I that she had a legal right to the northern part of North America, based on the land claims of early English explorers like King Arthur, Prince Madoc, and John Cabot. Queen Elizabeth I asked Sir Francis Walsingham, her Secretary of State, to come up with a solution. Walsingham teamed Sir Humphrey Gilbert up with Sir George Peckham. Peckham was one of the wealthiest Catholics in England as his father had been Master of the Mint for King HenryVIII and Queen Elizabeth I.
John Dee chose the location for the settlement. 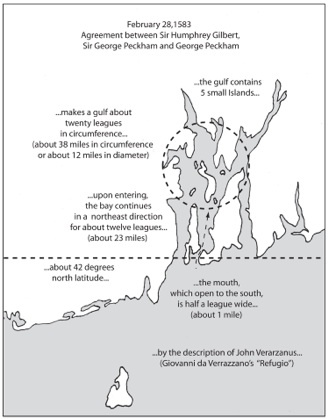 In 1525, Giovanni Verrazano had sailed the coast of North America from what is now South Carolina up to Maine. 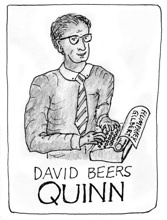 Quinn was a diligent researcher. After studying all he could find in the archives in London, he went to Madrid and unearthed some old letters that the Spanish Ambassador to England had written to King Philip of Spain. Based on the description of new colony in the deed from Gilbert to Peckham in the Elizabethan State Papers, historians agree that that the “Dee River” is Narragansett Bay. And the “port” was most likely the splendid natural harbor at the mouth of the bay, which is now the city of Newport. The Spanish Ambassador reported that under the leadership of Anthony Brigham, “two ships and a pinnace” (a small boat that could be sailed or rowed), left England in June of 1582, and they were gone for at least nine months. Their destination was kept secret, as the Spanish Ambassador had warned Walsingham that the Spanish would murder everyone in the colony, just as they had recently done to a French colony in northern Florida. constructing the tower designed by John Dee. Researching Anthony Brigham, I found that his father had been a clerk (an assistant) to Sir George Peckham’s father, the Master of the Mint. It became obvious to me that this “preliminary expedition” went to the Dee River and port to prepare a fort so it would be ready when Sir Humphrey Gilbert’s major expedition arrived later in the year. 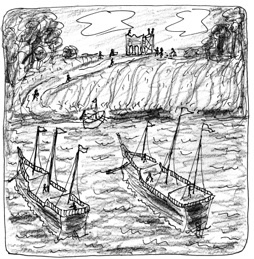 Gilbert’s main expedition suffered some delays, but 5 ships finally set sail from Plymouth, England in June of 1583. However, luck was not with them. After one day at sea, the sailors on the largest ship, under the leadership of Sir Walter Raleigh (Gilbert’s younger half-brother)came down with a contagious disease and headed back to England. The remaining 4 ships got lost in the fog, but they made a rendezvous at Saint John’s Bay in Newfoundland. In an official ceremony, Gilbert claimed the land in the name of Queen Elizabeth I. As many of Gilbert men were sick, one ship headed back to England, while the other three headed down the coast towards the Dee River and port. More bad luck. Off the coast of Nova Scotia, a tempest struck. The largest supply ship, the Delight, was tossed onto sand bar and the waves crushed to pieces. Now only two small ships were left. Gilbert made the tough decision to head back to England, but was committed to organizing a new expedition that would set sail the following spring. 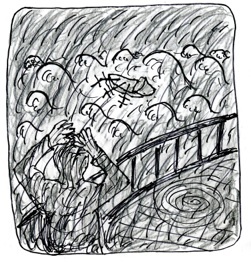 Off the coast of the Azores they found themselves in another violent hurricane.. This time the boat captained by Sir Humphrey Gilbert was swallowed up by a huge wave. Gilbert and his whole crew drowned. Only one ship limped back to England to relate the expedition’s sad tale. Sir George Peckham tried to keep the colonizing momentum going by organizing another expedition, but shortly thereafter he found himself back in prison for aiding his Catholic friends. The colonizing effort had fizzled out. Dee was so frustrated that his incompetent countrymen could not see the riches and opportunities of North America, he left for Europe where he traveled to the courts of various Princes and Kings for six years. Based on clues in the historical record, I have also concluded that early Colonial leaders knew the whole story of the Elizabethan colonizing effort. And they knew the tower was built to be more than just a fort. It was to be the city-center of a thriving colony, Elizabethan England’s gateway to North America. The Tower was a monument to the freedom of the New World, which was an ocean away from the troubles of Europe. I also assert that they also knew it was designed by John Dee. Not simply because of hearsay, but because of how the Tower functioned as a grand timekeeping device. [More on this in a moment.] John Dee would have been perhaps the only person in Elizabethan England capable of designing such an incredible structure. Even what remains of the Tower today doesn’t look at all like Colonial architecture of the 1600’s. Yet it is the oldest standing structure in Rhode Island. It is documented that it existed in 1677. But it contains many subtle clues that suggest it was to be even more than a fort and city-center. It was an architectural statement of John Dee’s mathematical cosmology. Its proportions and the way it functions encapsulated Dee’s vision of how Nature operates with regard to geometry, number, light, and the movements of the sun, moon, and earth. 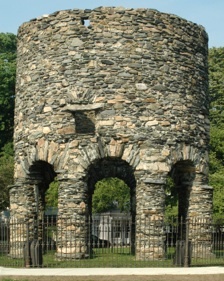 After 10 years of research I have determined that the 28-foot tall stone-and-mortar tower (that has baffled historians for centuries) in Touro Park, in the heart of Newport, Rhode Island, is the remains of a small fort designed by John Dee, and built by Anthony Brigham’s “preliminary expedition.” The fort was completed, but it was abandoned when the colonizing effort failed. About fifty years later, in the 1636, when the lands around Narragansett Bay were finally settled, I suggest that Benedict Arnold claimed the Tower and called it “his windmill” so that his zealous Puritan compatriots wouldn’t assert it was a Catholic church from the 1583 Catholic settlement and tear it down. The idea of expressing cosmology or worldview in architecture goes way back to the Greeks and Romans (and much further). Renaissance scholars were heavily influenced by new translations of the Roman architect Vitruvius’ Ten Books on Architecture, originally written around 25 BC. John Dee was instrumental in bringing Vitruvian ideas and NeoPlatonic mathematics to Elizabethan England. Fortunately, Dee wrote several books that explain his understanding of astronomy, geometry, number, and optics. He boiled his whole cosmology down into one little book called the Monas Hierographica. He felt it was worthy of a King, so he dedicated to King Maximilian II, the Holy Roman Emperor. Unfortunately, Dee wrote the text in such a cryptic manner that for the last four centuries, scholars have been unable to decipher its meaning. Central to Dee’s work is a his “Monas symbol,” a figure that embodies the concepts of Dee’s cosmology. In Dee’s Preface to the first English translation of Euclid’s Elements of Geometry (published in 1570), Dee explains that all the “Mathematical Arts” (like navigation, architecture, painting, geography, optics, and over a dozen others) are based on two things: geometry and arithmetic. Clues that Dee provides in the Monas Hieroglyphica led me to understand that Dee’s views of “how Nature worked” were identical to the views of one of the greatest thinkers of the 20th century: Buckminster Fuller. In 1927, Bucky set out to discover what he calls “Natures Operating System.” And he found it. It’s all described in two thick volumes called Synergetics: Explorations in the Geometry of Thinking. Bucky intended to publish a third volume showcasing the work of Robert Marshall, whose discoveries about “symmetry in number” dovetailed with Bucky’s discoveries about geometry. Unfortunately Bucky died, and this third volume was never published. In studying Robert Marshall’s work, I found that Marshall saw a number exactly the same way Dee did! I was able to solve the many puzzles Dee presents in the Monas Hieroglyphica, and Dee’s profound mathematical cosmology became clear. 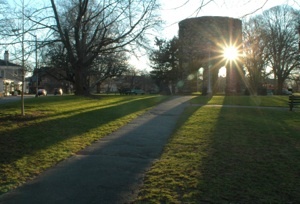 In 1996, University of Rhode Island astronomy professor William Penhallow discovered that they were “astronomical alignments” in the Tower. Various features of the Tower, like the windows and the fireplace, were positioned to align with celestial events like the Solstice or the Equinox. 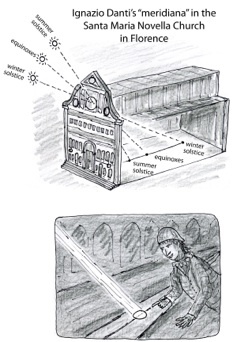 In Italy, these “camera obscura--solar disc-- calendar rooms” were used to confirm that the Julian calendar was “out of sync” with the sun by 10 days, leading to the reform of the calendar in 1583 by Pope Gregory. 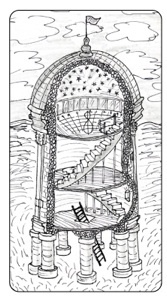 By piecing together clues from Penhallow’s astronomy, Buckminster Fuller’s geometry, Robert Marshall’s Numbers, and my understanding of the camera obscura, not only did Dee’s Monas Hieroglyphica become clear, but within Dee’s illustrations, I found what I call the “hidden blueprint” for the John Dee Tower. The simplest explanation is that it is built on a “two circle” plan. 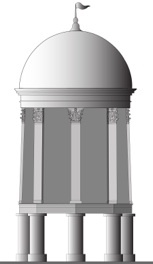 Based on Dee’s many clues, here’s my idea of what the what the John Dee Tower originally might have looked like: It stood 48 feet tall and had a huge golden dome, topped by a six-foot finial. The eight supporting pillars (that still can be seen today) were plastered smooth to look like polished marble. 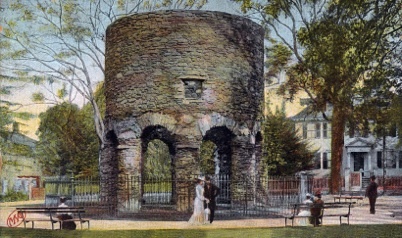 In fact, the whole upper cylinder (24 feet in diameter) was plastered smooth and was most likely faux-painted to look like red brickwork (using a popular Renaissance technique called sgraffito). Above the eight pillars was an entablature (a horizontal lintel that went around the tower). Resting on the entablature were 8 pilasters (flat columns) held securely to the stone-and-mortar with L-shaped cramp irons. These pilasters were most likely Corinthian, the most ornate of the three classical orders. Above the pilasters was wide upper-entablature on which the gold painted dome seemed to rest. But I think the dome was actually a made from corbeled stone-and-mortar, resting on the sturdy stone-and-mortar cylinder. A small hole in the dome would allow someone to observe the movement of the solar disc during the mid day, and especially as it crossed the Meridiana Line at noon. 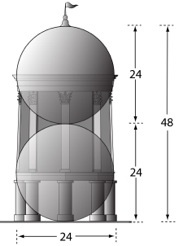 Outside the tower, the pillar section, the pilaster section, and the dome section were all built in proportions that reflected Dee’s mathematical cosmology. When he left for Europe in 1583, he was accompanied by his hired crystal-ball reader, Edward Kelley. Kelley claimed to be able to converse with angels and Dee kept copious notes of their sessions. In the mid-1600’s these notes were published and Dee’s reputation as a serious scholar was tarnished. It wasn’t until the late 20th century that academicians started to realize the importance of Dee’s pre-1583 works and the pivotal role he played in early Elizabethan explorations. Another reason is that Dee was not generally regarded as an architect. He is not known to have designed any buildings in England. But as Dee himself explains in his Preface to Euclid, “… those whom Nature has bestowed such ingenuity, skillfulness, and a good Memory, that they have mastered Geometry, Astronomy, Music, and the other Arts, and who have surmounted and passed the calling and state of Architects can finally become Mathematicians.” Dee was a great mathematician, so he undoubtedly considered himself a capable architect as well. to solve the puzzle of the Newport Tower? Dee cherished his Monas Hieroglyphica. Not only did Dee want to share his cosmology with King Maximillian II, he also included in his book a “rare gift” for the King ( I’ll give you a hint: Dee’s “rare gift” is a special number). Indeed, Dee even explained his Monas Hieroglyphica in private audiences with Queen Elizabeth I in London and Maximillian’s son, King Rudolf II in Prague. 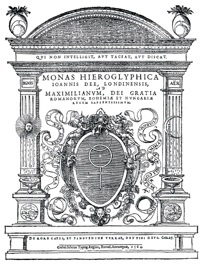 The John Dee Tower contains all the concepts hidden in Dee’s mathematical cosmology of the Monas Hieroglyphica, only built in stone and mortar. The Tower is an architectural Monas symbol. 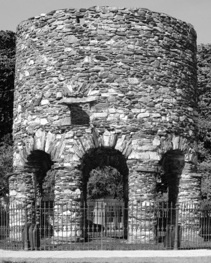 My assertion that the Tower in Touro Park is the remains of a Renaissance building of America means I believe it to be of remarkable historical importance. But its value goes beyond it being a historical artifact. It contains important lessons Dee wants us to learn about the interconnections between geometry, number, light, and the movements of the sun, moon, and earth. Unfortunately, the New World colony failed to take root, and the New Time (English calendar reform) was rejected. This rejection was another reason Dee was fed up with London politics and moved to Europe. 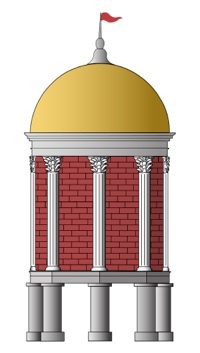 Based on my research, I think the tower originally looked something like this: An elegant classical building, 48 feet tall, with a 24-foot diameter gold-painted dome (which is topped by a 6-foot tall finial).